When someone has their blood pressure measured they are actually having the force of the blood through the arteries measured. 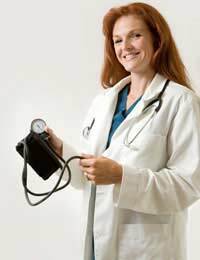 The top number or systolic reading of a blood pressure measurement refers to the highest amount of force exerted on the walls, whilst the lower reading, or diastolic, refers to the force when the flow has relaxed.If your are suffering from low blood pressure it is called hypotension, whereas high blood pressure is known as hypertension. Why Would my Blood Pressure be High? There are several reasons why your blood pressure may be high, not all of them necessarily bad. If you are experiencing stress, which when intermittent may not be a negative thing, your blood pressure may become raised, as it might if exercising or exerting yourself in some way. These are healthy types of high blood pressure and should normally reduce back to an acceptable level once the body has calmed down. Dangerous types of high blood occur for many different reasons. A diet high in fat can cause a build-up of fatty plaques in the blood vessels called atheromas, these cause narrowing of the vessels forcing the heart and circulation to work harder to pump blood as effectively around the body. Those who smoke, have a diet high in salt content can also suffer from raised blood pressure as can a lifestyle that is continually stressful. Many diseases and disorders of the heart can cause blood pressure to become raised, many of which are dependent on lifestyle choices that have contributed to the damage.Some existing medical ailments and illness can cause a raise in blood pressure such as diabetes. It is important to find out if there is an underlying reason for your hypertension and treat this as necessary. If left untreated, high blood pressure can cause many serious health problems and can even be fatal. This is because hypertension is often a symptom that something is wrong elsewhere in the body. Your GP will try and find out the cause of the high blood pressure, such as narrowed arteries and treat it before it develops further. Illness that result in high blood pressure include angina, heart disease, kidney problems, hormonal problems or because of substance abuse, to name a few. Commonly known as the silent killer, high blood pressure can remain symptom free for many years, whilst the body quietly tries to cope with the added pressure.For others headaches, flushing, tiredness and feelings of anxiety can all be signs that blood pressure is high. The single most effective way of reducing blood pressure is to change your lifestyle. Stopping smoking, increasing the levels and amounts of physical activities and altering diet can save your life. If you have an exceptionally stressful life whether it be raising a family or from a highly pressurised job, try and find a suitable an appropriate method of relaxation. It is vital for all of us to take some ‘time out’ and allow our body to return to its normal state of well being. For those who have been diagnosed as suffering from hypertension, it is vital that you discuss the subject thoroughly with your GP as it must be addressed before serious illness occurs. If you are prescribed medication, make sure it is taken as and when expected and do not stop taking it if you feel better of have changed your lifestyle. Your GP will decide if and when dosages need altering. The subject of blood pressure is a very wide one and there are many factors involved in its diagnosis and treatment. Each person should try and do their best to prevent high blood pressure or to lower it if it has crept up. This is most easily achieved by altering lifestyle and changing habits.